Home » Events » The International Beatles On The Beach Festival, April 25-28. 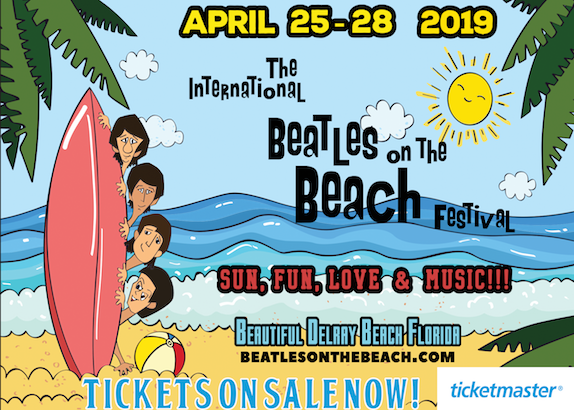 Save The Date for The International Beatles On The Beach Festival, April 25-28. Ticketmaster.com and Old School Square Box office. celebrating the iconic music of The Beatles. The Legendary Edgar Winter Headlines along with McCartney Mania backed by a full Orchestra! + Special Guest Stars! A highlight of the Fest is BeatleCon, all guests are urged to channel their favorite Beatle, Rockstar, Superhero, Harry Potter character, Blue Meanie, Lord of the Rings, Star Wars, Furry Animal or psychedelic 60’s to 70’s hippie! Groovy prizes will be awarded for the most inspired and authentic costumes! Ticket holders receive discounts and FREE FOOD and DRINKS Across The Universe. The Delray Universe of course! See Website for Details. Please see more details below! **We also have Sponsorship Opportunities to get involved in this inaugural event! Call 561-666-8298. • April 25th- Flocks of Beatles Fans will be arriving to start the celebration, checking into their hotels, and making their way around to the restaurants, clubs, clothing stores, & all merchants that are participating in this grand event. Festivities begin at 6pm with “Pineapple Grove Forever”. The Downtown Development Authority will be shutting down 2nd Ave, turning it into Abbey road and celebrating the Beatles and the best of the Grove, with live music from 6-9pm. Boston’s On The Beach will continue the action with Across The Universe Beatles Tribute Band starting at 9pm. • April 26th Amazing bands such as our headliner, Edgar Winter, playing #1 classic hits, Free Ride and Frankenstein heard millions of times over. • April 27th- In addition to the bands, performers and artists, a grand concert featuring Beatles Tribute Band, McCartney Mania, accompanied by The Academy Orchestra, conducted by Maestro Thomas Servinsky on stage at Old School Square. • April 28th- Beatles Breakfasts, Brunches and Lunches to be held at participating restaurants. Don’t miss Beatles Bootcamp hosted by PurLife and H.I.T to be held at Veterans Park at 9:30. • Everyday- BEATLECON This is a major part of the event, where we urge you to dress in costume as your favorite Beatle, Rockstar, Superhero, Harry Potter character, Blue Meanie, Lord of the Rings, Star Wars, Furry Animal or favorite 60’s & 70’s hippie! Dress up and have FUN!! Everything and Everyone welcome! Prizes awarded for best costumes! Strolling Beatles musicians will be performing up and down the beach and the streets of Delray Beach all day and night! Don’t be surprised to see bongo, kazoo, ukulele, and banjo performers jamming, Yellow Submarine + Hey Jude on the street corners! + an Octopuses Garden for The kids!